1. M-61 POWER GLOW PEEL - Amazing for rejuvenating the skin and cell turnover. You simply wipe all over your face and leave on overnight. Its a glycolic treatment so instantly cleans and stuff off dead skin and helps with hyper pigmentation, scarring, and texture! 2. SUNDAY RILEY HYDROACTIVE CELLULAR FACE - Hydration, smooth skin, glowing skin, brightening and so much more! This is my favorite oil right now to sink in and totally replenish my cells and give me a gorgeous glow. SKINCEUTICALS CE FERULIC - This is my go to for every single day and I will never not use it! It is one of my all time favorite products! I love it specifically for help with hyper pigmentation and brightening my skin! 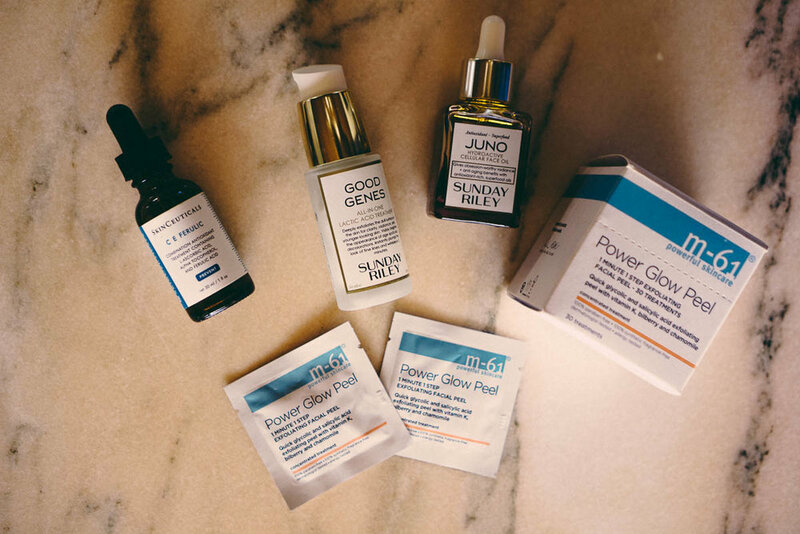 SUNDAY RILEY GOOD GENES - Similar to M-61, glycolic peels help with everything from aging, to discoloration, to rejuvenating the cells to where you can see visible change as soon as you wake up. Your skin will be glowing. If you have been following me on instagram for a while, you'll know through my insta story and posts that I love to try new facial products. I have always been into being healthy, but as I got into my later 20's, I started to invest in my skin, especially since I model and want to have a long career! I ask makeup artists all the time what their favorite products are. Over the years, I've come up with my arsenal that I always use (along with always trying new product recommendations). In this post, I wanted to share some of my favorite products I am using NOW. I will continue to try new products and update my list when I love something and think is worth sharing. For today, Im loving these! Have you tried any of these? Do you have any recommendations for me that I have to try? I'd love to know! !